This was set to post on Tuesday but didn't for some reason so Happy Thursday! 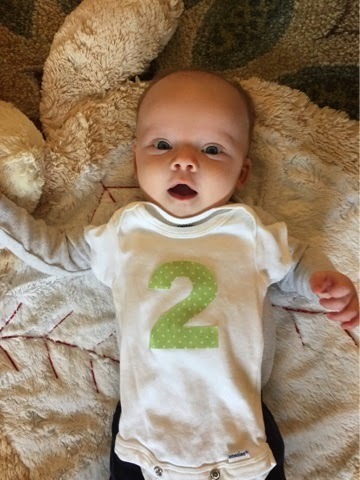 Today marks GMac's last day as a two month old so you know what that means, time for his TWO month update! GMac has become such a happy baby (not that he wasn't before, but he's just really happy now). So long as his belly is full and he's awake you'll find a smile on his face or hear him trying to participate in the conversation. Speaking of him speaking, his voice is a bit louder than his sister's was at that age. The little man wants to be heard! We can usually count on a 5-6 hour stretch at night (with some anomalies here and there). He's wearing 3-6 month clothing with a few 0-3 month items that still fit. He has also graduated to size two diapers. It took monkey several months to get to size two diapers and she didn't weight 13 pounds until well into her fifth month. We better start saving up now to feed this guy when he's on solids.